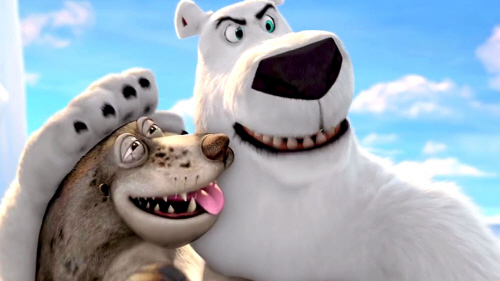 Norm of the North comes to us from Splash Entertainment riding atop the Lionsgate Films distribution train; yes the same individuals responsible for what has become of the once-bright Alpha & Omega franchise. Going in with this handicap alone should have clued me in to the type of entertainment experience to expect. However, I still continued on, blank slate into the project as it were. One thing that’s immediately clear from the onset here is that the additional budget (over the above mentioned TV series) definitely allowed for the integration of better visuals, smoother animations and much richer textures. Unfortunately, that’s about where the compliments end. Norm of the North is a 2016 American computer-animated comedy-adventure film directed by Trevor Wall and written by Daniel R. Altiere, Steven M. Altiere, and Malcolm T. Goldman. And, despite being massacred by critics, somehow managed to turn a pretty healthy profit margin at the box-office; having been created on a budget of $18-million and turning that into $27.4-mil by the end of its theatrical run. 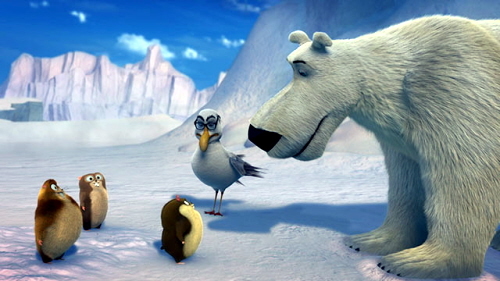 The story here tells of Norm, the Polar Bear (Rob Schneider); the son of the King Of The Arctic. In his youth, he develops the ability to speak to humans, a trait shared by his Grandfather (Colm Meaney). Because of this, he is outcast from the other animals, aside from a bird Socrates (Bill Nighy) and Elizabeth (Kate Higgins), a female polar bear/ Norm’s barely-used love interest. Things operate about as normal as can be expected for a talking/ dancing polar bear in the wild until a condo-manufacturing outfit drops off the first of its new arctic homes with intentions of filming a commercial there. Dancing Norm, obviously, isn’t going to take this sitting down and, with the assistance of some very Minion-esque lemmings, hatches a plot to scare away the crew of the project. From here it’s a muddled hour and 20-minutes more of Norm running around Manhattan, convincing the world at large that he is merely an actor in a bear suit on account of his ability to speak English. His target is the mogul behind the condo operation, a bizarrely developed pony-tail sporting weirdo curiously named Mr. Greene (no environmentalist agendas here or anything). He’s voiced by Ken Jeong in one of the only vocal performances I’m aware of that sees Ken get to play a male. Now here’s where things go from odd to worse; we discover that money-obsessed Mr. Greene, corporate man to the end, has apparently captured Norm’s English-speaking grandfather and is holding him captive. Gee, don’t you think that maybe this guy, who is presented as trying to make a profit on everything under the sun, may have thought to charge admission to see the world’s only talking bear? Or sold him off to science at the very least? Nah, throw the talking bear in the cage and let’s focus on putting up condos in one of the more inhospitable places on the planet. 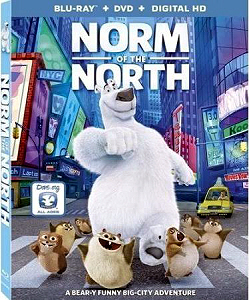 And that, in summation, is the experience of watching Norm of the North in a nutshell. Now these are animated movies for children and I respect that but it’s been my experience that children are some of the toughest critics of them all. And the worst part is that the team behind this one was blatantly aware of that fact as well and made certain to load up the film with all sorts of terrible gimmicks designed to elicit a cheap laugh: Dancing polar bears, lemmings urinating all over the place, flatulence jokes aplenty. Surprisingly, this is one of the rare animated films to feature the generally comedic Rob Schneider in the lead that doesn’t come off as a complete and utter train-wreck. 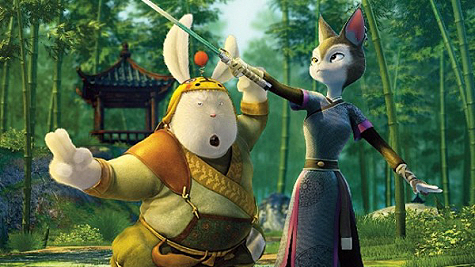 A lot of this stems from the very clear fact that this was a film written and animated for its English-speaking cast. This makes all the difference in the world when attempting to get a believable performance out of an actor without the limitations of having to time their dialog to the mouth flaps of a foreign film. Watch Schneider’s performance in the abysmal Legend of the Sea for further proof of this phenomenon. All told, there were a few moments where I really began to question the harsh assessments of this production. It literally has all of the pieces of the puzzle for success: A decent cast, solid visuals, human character models that appear to have been lifted from Despicable Me, for that matter even a gimmicky little troop of fur balls that they were clearly hoping would become the world’s next Minions. At the end of the day though, the finished product feels convoluted, nonsensical and tries way too hard to take it and its agendas seriously. I suppose the lesson here is that if you’re intention is to try and rip off and combine Despicable Me with Happy Feet, go all the way with their vastly superior sense of silliness where applicable as well. Were you to peruse the (limited) promo materials or stills of this one, you’d likely be inclined to think it’s a grade-B CG piece hoping to capitalize on the success of domestic rodent-centric success stories like Pixar’s Ratatoile or Universal’s The Tale of Despereaux. While this may be true, the finished product is actually more fantasy themed than expected, coming off like a low-rent animated version of Lord of the Rings. Or perhaps even more pertinently comparable; think of this as a less interesting, poorer animated version of 2010’s Legend of the Guardians: The Owls of Ga’Hoole. With mice. 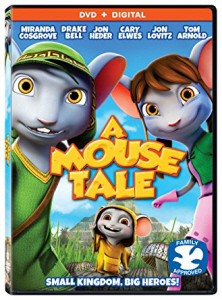 A Mouse Tale is a film with a laundry list of production companies involved in its creation, names like Grindstone Entertainment Group, Red Post Studio, Simka Entertainment, and Mandate Films just to mention a few. The reason for this is that amortizing the expense of creating a CG animated feature from scratch sometimes makes the most sense by dividing it among as many parties as possible. As such, this one is a collaboration Argentina, Peru and the USA and enjoyed global release upon completion. Here in the US it received a direct-to-DVD release on February 10, 2015 from Lionsgate Films. Budget and profits/losses have never been made public, perhaps on account of the many companies involved in the film’s development/ distribution. 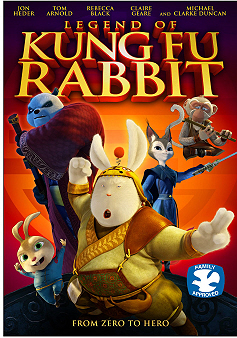 The story sets things up with the typical fantasy trappings- In order to save their kingdom from evil rodents, Sebastian (Drake Bell) and Samantha (Miranda Cosgrove) are sent on a quest by the King of Rodencia (Jon Lovitz) to obtain a legendary magical crystal which has the power to defeat the rodents. With the help of two trustworthy knights, they must venture deep into the forest and enter the forbidden world of giants in order to accomplish their mission and restore order to the kingdom. If this all sounds a little formulaic to you in summary, it’s certainly going to feel so in delivery. A by-the-numbers plot structure, animation and textures that are at least a decade late and mostly forgettable characters (even the always-on Jon Heder can’t save this one) all result in a slog of a quest that feels longer than its 92-minute run-time. Is this to say the entire film is unwatchable, then? No, not exactly- younger viewers may find the fantasy elements and the protagonists interesting enough to enjoy the ride and though it adds nothing new to the CG film fold, it doesn’t go out of its way to offend older audiences with agendas or preachiness. In fact, about the biggest crime the film creates is that it simply doesn’t engage its viewer with anything along the way to make the trip worth taking in the first place. Attempts of humor are weak and rely more upon lousy visual gags than they do good writing or comedic delivery. The cast is quite stellar and clearly do what they can with the material but as is so often the case with English dubbed foreign films, there is only so much that can be done in post-production. Keep in mind that what we call A Mouse Tale is in fact a redubbed and packaged South American film called Rodencia y el Diente de la Princesa released back in 2012. In the end, the film attempts to redeem its cliche’ nature by tying some of its fantastical prophecies with the real world and some of humanity’s best-known myths but it all comes off as uninspired and not near as clever as it could have been. All in all A Mouse Tale, like so many foreign films given the dub treatment before it, comes off as feeling flat and listless from opening frame to final credits. The story here has some merit, as epic fantasy works well in CG. As do talking rodents for that matter. As it stands, however, the finished product is under-written and over-acted. There are worse CG films out there to be sure but this one has the potential to be more than the sum of its parts. By the time this, the fifth Alpha and Omega film came around (do keep in mind the 8th is about to be released at the time of this review’s writing), the crew at Crest themselves even realized things were becoming a little long in the ol wolf’s tooth. Already aware of the fact that subsequent entries to the series would be developed and released by Splash Entertainment (but still distributed by Lionsgate), they did exactly what you would expect with the last entry to wear their name: they used it as an excuse to flash viewers back to most of the moments leading up this far. 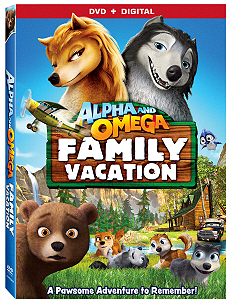 Released on August 4th, 2015, Alpha and Omega 5: Family Vacation came into being like the three movies that preceded it: a 45-minute, $5-million budgeted all-ages-friendly romp. This one bears the distinction of being first aired on Discovery Kids in Mexico (March 28, 2015) as a made-for-TV movie. It was later released worldwide on DVD in August 4, 2015. 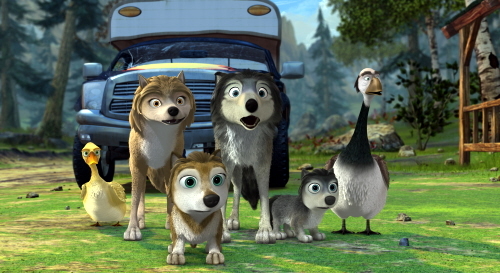 The setup for this one plays on the plan of Kate and Humphrey’s to take their pups to Alfred Creek Falls for a vacation, where, as expected, they find themselves embroiled in a cross-country chase after having been spotted by wold trappers. Not to worry if this one sounds a little light on plot, as indicated above, the story is just the catalyst to to string together a whole bunch of recycled scenes from the previous films in the form of remenission-style flashbacks. Given the film’s (or rather the series as a whole’s) apparently ever-decreasing target demographic, it comes as little surprise that the final entry from Crest Animation is little more than a thinly-disguised rehash. There’s little here to celebrate or criticize; in fact if you own or have access to the films leading up to this one, you’ve seen the majority of the content here already. What is fresh, while in no danger of threatening National Lampoon’s dominance on the subject matter, pokes fun of the dynamic of traveling cross country with the kids. Adults may find the occasional chuckle here. All in all, the trend of Alpha and Omega turning less a runaway theatrical success and more a made-for-TV series continues right on schedule with this entry. 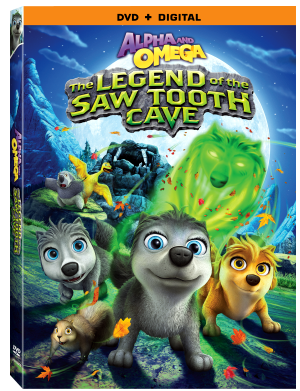 Though not as original or adventurous as Legend of the Saw Tooth Cave, it does manage to succeed over The Great Wolf Games in terms of its comedic nature and pacing. 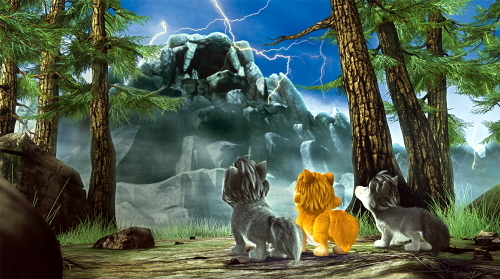 Younger audiences may not tire with the material quite as quickly as adults (especially adults who have recently seen the earlier entries of the series) but it’s a bit of a stretch to insinuate that Crest went out with a bang on the franchise they were so instrumental in developing from the onset. For better or worse, the franchise would be handed over to Splash Animation after this one and while in no danger of ever being considered a narrative (or animated) masterpiece, it does serve as a fairly consistent bookend to the Crest era at the helm. Even if you’re already quite familiar with many of the chapters within this book. 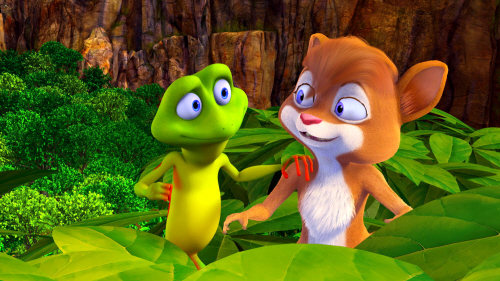 Released on June 21, 2014, Ribbit is the result of a collaboration between Malaysian Kru Studios and Crest Animation Studios. It’s 88-minutes long and while budget and profit/ loss info has never been made public, it debuted at the Cannes Film Market in 2012, premiered at the Niagara Integrated Film Festival on 21 June 2014 where it won Best Family Film. It had a theatrical run in Malaysia in September 2014 and was released in the United States directly-to-DVD thanks to LionsGate on November 25 2014. 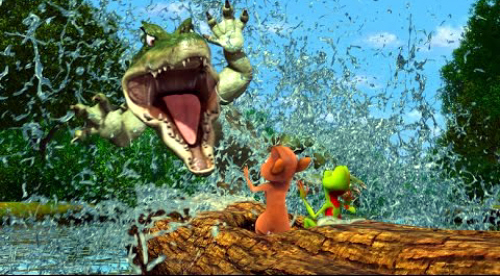 Ribbit falls into what I consider a very gray area of animated features. It’s a near-hit in every single category that matters yet somehow manages to come up short every step of the way. Let’s start with the good. The film has some nice visuals. No not the type we’ve come to expect from Pixar and DreamWorks but it does make use of a very vibrant color pallet. Some of the water textures look amazing along the way and the character models all emote well. This movie was done at Crest Studios, perhaps best known for their work on the Alpha and Omega franchise. These guys aren’t a top tier production house but they certainly have a good handle on the animation game and how to extract the most from the CG medium. 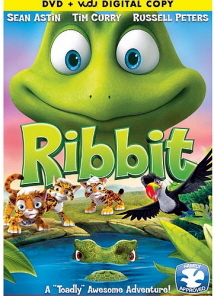 Since this was a film animated around an English script and vocal performance, Ribbit (fortunately) doesn’t contend with the issue of trying to dub an English language track atop a foreign film. If this doesn’t seem important to you, please take a moment to skim through some of my past reviews that make use of the practice and the common theme of what disasters the end result becomes. Another plus is that the film does its very best to build a dynamic between the two lead characters- never mind the oddity that is a poison dart frog and a flying squirrel falling in love, let’s just leave it at their character arc develops pretty steadily from the first frame to the final. Now the bad. Perhaps the film’s greatest crime is one of pacing. The story centers on titular character Ribbit suffering a bit of an identity crisis and becoming convinced, via the persuasion of a hypnotic vampire bat’s suggestion, that he is in fact a human prince in frog form. In typical fairy tale fashion, he becomes certain that a kiss from a human princess could lift the spell placed upon him and return him to his natural form. Of course along the way he discovers, through a series of spoon-fed lessons, that he is special the way he is and that happiness could be found in his own backyard. While in no danger of winning any cleverness awards, the story is passable enough, especially for a film that claims its target audience should be between ages 5-7. I can go off on a tangent here and remind all animated movie studios everywhere that part of what has made companies like Pixar and DreamWorks so successful is that while they cater to the youth, it’s their appeal to the adults who purchase the children’s theater tickets that keep people coming back for more. In any event, let’s talk pacing. The first half of the movie is chock full of exposition that kids will undoubtedly tire of in a hurry. Ribbit encounters a succession of animals (from oecelots to a bat to a toucan to a manatee/ hippo couple to a caiman etc.) all of whom teach him some lesson of self discovery. Nothing wrong with this but again, 7-minutes of straight dialog with each simply isn’t going to cut it with the youngsters. One gets the feeling the producer’s realized this and, rather than make some trims in the name of flowing narrative, they tried to jam as much action as possible into the spaces between all the dialog. There are near-misses aplenty! From planes falling out of trees to trips over a seemingly endless succession of waterfalls to escaping sticky spider-webs; the tale of Ribbit can best be summarized in two words: Close & call. The final nail in the pacing coffin comes in about the final 20-minutes of the film when suddenly a whole new subplot is dropped into the viewer’s lap involving a tribe of indigenous humans and an assassination attempt a little animal cruelty and so on. Again, by themselves, none of the elements here are poor. But sandwiched together the way they are is a bit odd. The first half of the movie is tedious, laced with exposition and fairly lackluster then suddenly a new story comes in from seemingly out of nowhere that allows for a big climax complete with Hollywood style happy ending. The vocal cast does a pretty bang up job here with Ribbit being played by a convincingly insecure Sean Astin. 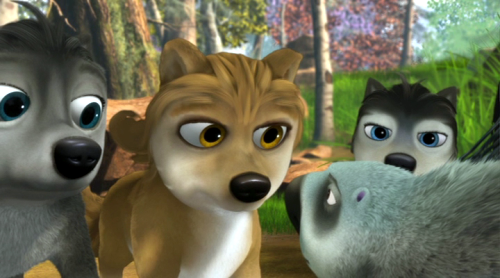 Relative unknown Cherami Leigh does a very nice job with the flying squirrel sidekick Sandy. Tim Curry and Russell Peters have fairly minuscule parts that could likely have been just as well performed by scratch actors. As a whole Ribbit certainly doesn’t commit any of the glaring faux pas that usually equate to an instant kiss of death for viewer enjoyment but neither, though, does it deliver anything quite well enough to make it memorable or even endearing against an ever-expanding ocean of CG animated feature films. I suppose that could be enough to give any frog an identity crisis. 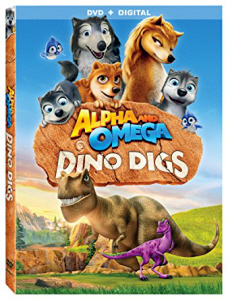 When LionsGate released Alpha and Omega back in 2010 theatrically could they have had any idea the film would be the start of CG animated film franchise the likes of which would have more entries than even Shrek or Open Season? At the time of this review’s writing, there are six Alpha and Omega Films available with another two on the way. Only the first three of these bother with numbering their titles, after that point the producers figure each entry serves as a stand-alone piece so it really doesn’t matter what order you view them in. 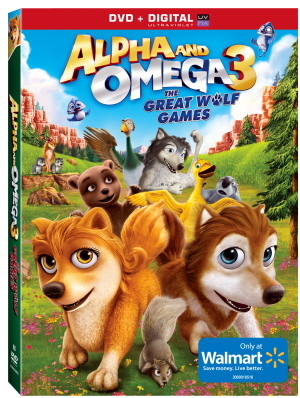 In order of release it looks like this: Alpha and Omega (2010), Alpha and Omega 2: A Howl-iday Adventure (2013), Alpha and Omega 3: The Great Wolf Games (2014), Alpha and Omega: The Legend of the Saw Tooth Cave (2014), Alpha and Omega: Family Vacation (2015) and Alpha and Omega: Dino Digs (2016). 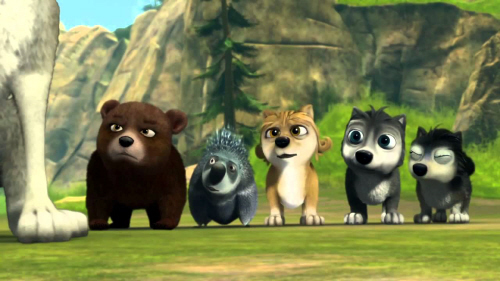 The next two up on the list to be released are Alpha and Omega: The Big Fureeze and finally Alpha and Omega: Journey to Bear Kingdom. If 8 films seems like an awful lot of material to stretch from a movie that seemed to just about have enough material to fill its 90-minute run-time to you, I’d say go with your instincts here. You may also notice that the frequency in which Crest Studios is creating these movies has greatly increased between the first film and the first sequel- this is because after the first one, the rest became direct-to-DVD affairs and clock in at around 45-minutes each in length. As you might imagine, the budget for the production of the rest of them was greatly decreased after the first film as well. For comparison’s sake, the original was created on a budget of $20-million and took in $50.5 mil at the box office. 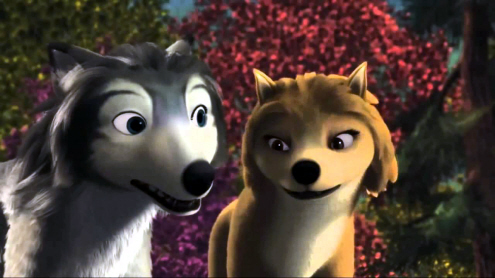 It immediately became Crest’s highest grossing CG animated piece and literally put LionsGate on the map as a major CG motion picture distributor. 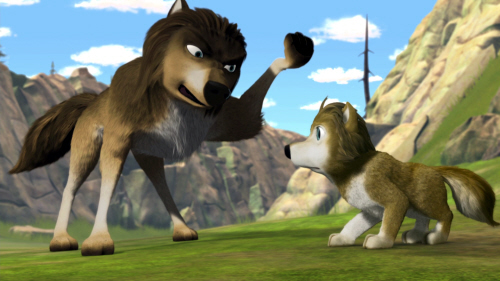 So, all of that doesn’t tell us much about the sequel, A Howl-iday Adventure does it? The hard facts place the budget at an estimated $5-million. The final run-time comes in at 45-minutes. 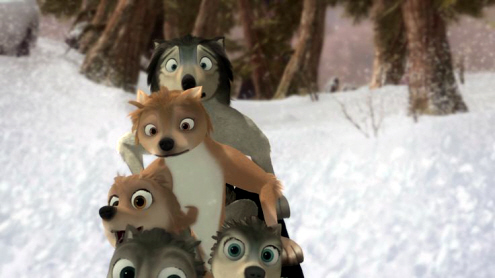 The story this time centers on Kate and Humprhy’s (the wolves of the first film) three young pups: Stinky, Claudette and Runt and their first winter together. 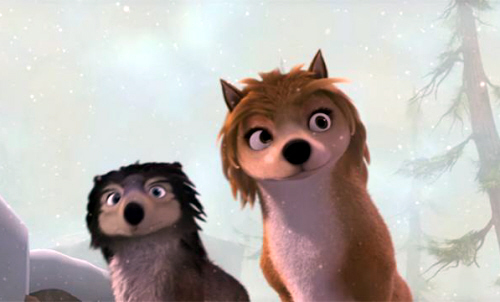 While their parents prepare to have their families together for the holidays, Runt mysteriously disappears after a chance encounter with rogue wolves. 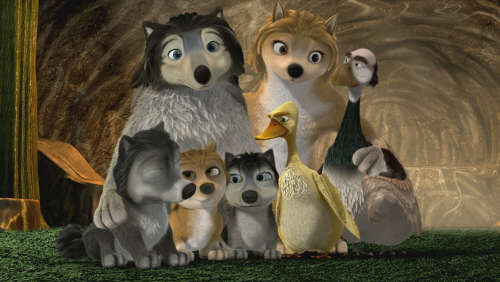 The remaining pups, along with their families find themselves thrust into an impromptu journey across the wilderness in the hopes of finding and bringing Runt back before the winter snows block their way home. I generally like to dig a little deeper when it comes to themes nestled within the plot but truly, that about sums this whole affair up. 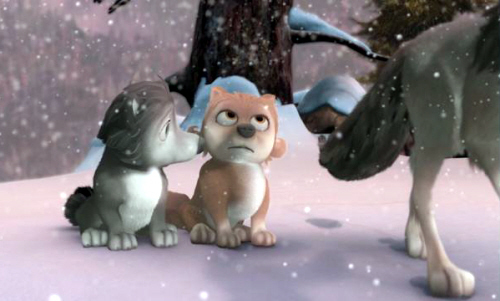 When one of the pups goes missing, the family heads off on a rescue mission. Most of the characters from the original make an appearance though forming any sort of connection with any of them proves extremely difficult. As expect in a whole film that concludes in about 40-minutes (that final 5 is comprised of credits), it becomes immediately clear that pacing was a real production issue. Somehow, though, Crest manages to make the plot drag. Thanks to a habit of focusing on inconsequential aspects of the journey while tying up plot threads in seconds, there is never a steady rhythm for the viewer to become lost in here. Additionally, the suspicion that a few holiday elements were shoehorned into the film to make it somewhat marketable becomes overwhelming by the end. Visually the film, as expected when a $20-mil budget is reduced to 5-million, the film takes a major step back compared to the first movie; which, even by 2010’s standards was hardly revolutionary for the genre. Character models and animation cycles are greatly simplified here, textures muddled and settings unremarkable. Many of the original film’s vocal cast has also been replaced by actors left to do their best impression of the celebrities they replace. I’m of the opinion that the first film became an unexpected runaway success on account of the fact that its heart was bigger than its budget. The sequel comes off as feeling like a very poor attempt to capitalize on the name & success of the first film. In the event that that isn’t quite enough, marketing it as a future holiday classic was integrated as a contingency. Surely had this been the piece to kick off the franchise, the whole thing would have disappeared quietly shortly after its release never to have been heard from again. That being said, the success of the first film apparently carried with it enough gravity to where the mistakes of the second couldn’t keep the freight train from derailing as indicated by the fact that six more films in the franchise follow this one. The general consensus seems to consider this one the weakest of the entire lot and looking at the behind-the-scenes, it sort of makes sense. This film was originally conceptualized to be a theatrical release, just like the original but with a doubled budget ($40-million). It’s said that production issues and disagreements were such that director/ co-writer of the original Ben Gluck left the project. Rather than scrap the entire thing, the budget was knocked down to a fraction and the project retooled for direct-to-DVD status. Sadly, the end result manages to hide very little of this fact.